KOTA BHARU, 6 Dec 2013 – The National University of Malaysia (UKM) plans to build a RM30million complex for its alumni which can be a landmark in the campus which they can be proud of. Deputy Vice chancellor (Students and Alumni Affairs), Prof Dato’ Ir Dr Othman A Karim hopes the project can be carried out soon with the close cooperation of the UKM alumni. He was opening a workshop for members of the working committee for Reporting and Developing Directions For the UKM Alumni here today. Prof Othman said members of the committee needed to understand and support UKM’s mission of upholding the position of Malay as a language of learning globally, ensuring the effective delivery of all the university’s services and able to shape a creative leadership with a culture of innovation and able to produce graduates who are competent and competitive. He said the Centre for Alumni Relations was set up not carry out activities for the alumni but to be the liaison and facilitator between UKM and its alumni. The setting up UKM’s alumni chapters in the campus as well as in all states in the country as well as at the international level will help to foster closer relationship between the university and its alumni. 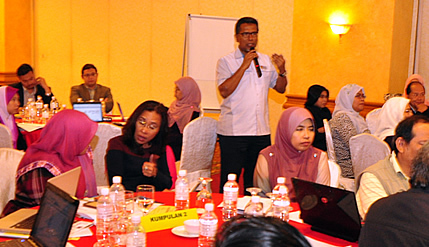 The Centre, Prof Othman said, needed to have closer relationship with members of the working committee to disseminate information on development of UKM especially its plans and transformation to ensure support. He hopes UKM’s alumni can be ambassadors to build a positive perception of the university among the people. The Alumni Information System also needed to be updated and disseminated for easy access to enable all its alumni to register. The workshop was also attended by Director of Alumni Liaison Office, Assoc Prof Dr Marlyna Maros and Deputy Deans of various faculties.